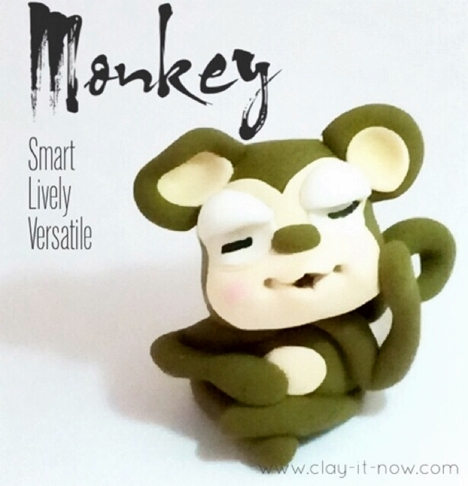 This cute monkey figurine was created as part of my 12 animals in Chinese zodiac. You might wondering why the clay color on my finish monkey figurine different with the step-by-step pictures. Thanks for your observation. It took me few minutes to figure it out too and finally concluded that it was because of lighting effect. I took the pictures of step-by-step at night with yellow light and charcoal colored paper as the base. The finish figurine picture was taken in the morning with white light and white paper as the base and background. Hm....or, was it because I used flashlight on the finish figurine? Anyway, hope you don't mind with color. Let's have fun making this monkey. So, how to make monkey in easy way? I have prepared a tutorial which was divided into 2 parts. Part 1 would be covering all parts below the head (body, legs and arms). And, part 2 is all about the head and facial expression. By the way, do you have the clay? If you don't have it yet, try our homemade clay or buy an air dry polymer clay which will dry hard. 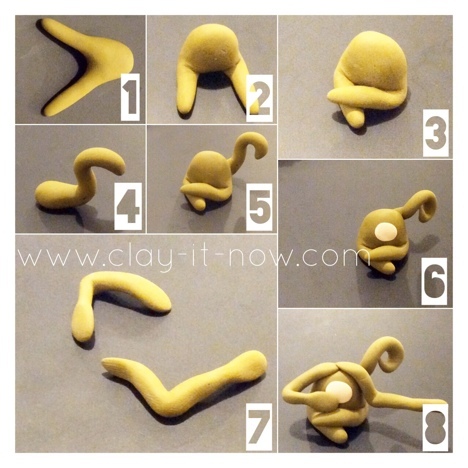 First of all, choose the clay color you like for the figurine and knead the clay until it's warm and soft. Roll the clay to a ball shape at about 3 centimeter in diameter (you can make it smaller or bigger). Press the clay ball a little bit. Use scissor to slit one side of the circle up to the center. Pull these two parts out and use your index finger and thumb to make pipe shape until it looks like V.
Bend the other part of the circle. Use tissue paper or tape to hold the body of the monkey if it is too soft to stand by itself. Cross the two pipe shapes and leave it for a while. Now you can make the tail from pipe/ spaghetti clay shape. Attach the tail to the back of the body. 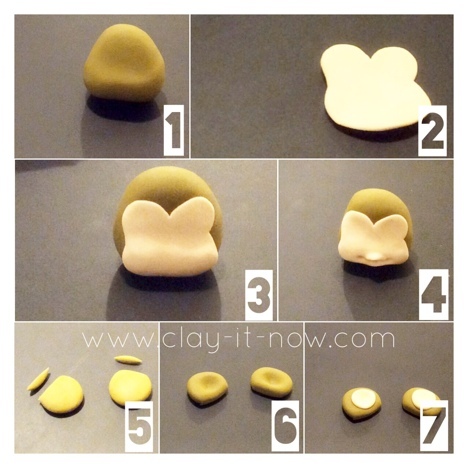 Make a small ball shape in light clay color, flatten it and paste it on the front body part. Next, you can make the arms/ hands as shown in the picture. Roll the clay to a ball shape again and press the two side to make it looks like triangle with rounded edges. Roll light color clay, flatten it and cut with scissor or clay knife to form face like picture number 2. Paste the face to monkey's head. Use your smile tool to create the smile/ mouth. For simple smile you can use half drinking straw. For ears, you can follow the steps number 5 to 7. When it's done, paste it to the head. Add the nose, eyes and the eye lids. You can draw the eyes in different shape for different expression. You have cute monkey figurine now.